This paper establishes the equivalence of the phase only filter and a complex-valued neural network, and then shows how neural network learning can be utilized to enhance the capability of phase-only-filter based system. Specifically, the capability of phase only filters in pattern matching tasks is enhanced by using complex-valued, neural network learning algorithms. By incorporating the neural network based learning, the recognition capability of phase only filter under various transformations and distortions can be enhanced. © Anita Publications. All rights reserved. In this work we present numerical simulations and experimental results on the use of regions of support applied to phase only filters, in pattern recognition problems. The regions of support indicate the pixels of the phase-only filter which are blocked, following an optimization criteria for the correlation intensity distribution. We present results on the design of regions of support that optimize the discrimination capability between similar objects. We apply this technique to the recognition of monochromatic patterns, and also to the case of colored patterns using a multichannel correlation procedure. Finally we show experimental results of the implementation of regions of support using phase-only spatial light modulators. The implementation based on the addition of linear phase codes to the pixels belonging to the region of support. © Anita Publications. All rights reserved. 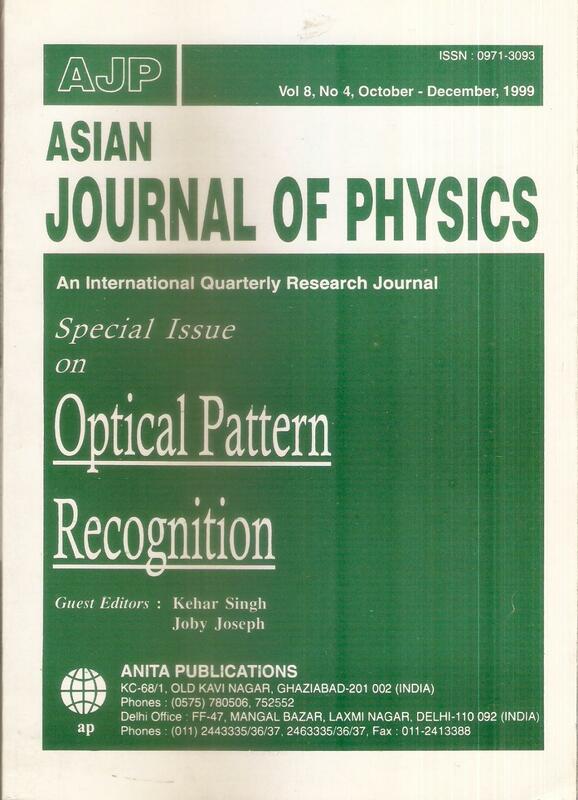 A real-time optical processing system is constructed with an optically addressed bistable spatial light modulator (BSLM) for an input object and a twisted nematic liquid-crystal spatial light modulator for a phase-only filter. In order to improve the pattern discrimination in a phase-only filtering correlator, the use of a phase-encoded input with the BSLM is required. The binarization in phase input can be suppressed the dc component, yielding the high discrimination. Helpful data on how the BSLM can operate the phase-encoded modulator are shown. A phase-only filtering correlator with the BSLM demonstrates high performance in pattern discriminability.© Anita Publications. All rights reserved. Several advances in designing composite correlation filters have been made during the last decade. Examples include unconstrained filters, maximum average correlation height (MACH) filters, distance classifier correlation filters (DCCF) and polynomial correlation filters (PCFs). We present a tutorial review of these advanced composite correlation filters designs.© Anita Publications. All rights reserved. Leicestershire, LEI 1 3TU. United Kingdom. We perform a study of the in-plane rotation invariance characteristics of the cascaded correlator and compare our results with those of a modified matched spatial filter (MSF), the equal correlation peak synthetic discriminant function (ECP-SDF). The degradation in signal-to-noise ratio as a function of in-plane rotation angle is numerically evaluated by computer simulation for cascaded correlators to demonstrate the effect of training set size. The correlator impulse response of each correlator is formulated by backpropagation and simulated annealing with a training set containing random images generated with an exponential shaped autocorrelation function. We show that the SNR for rotations intermediate to those in the training set improves with an increase in the training set size. However, the SNR of rotations close to those in the training set reduces. It is found that, for the same image space-bandwidth product (SBWP), the cascaded correlator remains rotation invariant over a significantly greater range of rotation than the ECP-SDF. For example, it is necessary to piecewise implement only three cascaded correlators to maintain an SNR greater than 0dB across the rotation range whereas the ECP-SDF system requires approximately 45 piecewise filters to obtain the same result. SNR is degraded to an equivalent level to that of the ECP-SDF over larger rotations intermediate to the training set. This degradation is found to decrease with increased training set size for both systems.© Anita Publications. All rights reserved.